Savage died yesterday ( May 20th, 2011 ) in Florida in an automobile accident. It’s assumed he had a heart attack and crashed into a tree, his wife was with him but was not seriously injured. As an adult, I was never a big fan of professional wrestling; as a kid I used to go to the occasional match that came to Town. I remember watching the likes of The Executioner, The Mongrol, The Love Bros., Andre the Giant, a collection of midget wrestlers, and the occasional women wrestling. What I remember the most is sitting next to the wrestling McGuire Bros. who were the heaviest twins in the World at the time according to Guinness. They took up almost the whole bench at something like 700lbs plus each. They’d come into the arena on minibikes, and drove tiny Austin Minis that had the front seats removed. I remember them talking to myself and a few of my friends and there was no pretentiousness about them. I also remember the bear ‘ Gentle Ben ‘, that at the end of the show they’d bring him out, muzzled, and ask if anyone in the audience had the guts to wrestle him. Of course all the women would be egging their guys on to do it, and a few would get up, and everyone of them would get pinned within a minute. 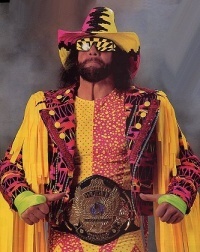 Like I said, as an adult I don’t much care about professional wrestling, but it’s hard to not notice some of them, and Randy Savage was definitely one of those. With his wild outfits, the raspy voice like he just smoked a pack of cigarettes, and his signature “Ooh yeah!”. It’s hard not to like a guy who always looked like he was having a lot of fun. We at TheTAZZone wish the Savage family all the Best and our sympathies go out to you and yours. Added by admin on May 20, 2011. Thanks Cher! The guy was, or seemed, from a non-fan’s perspective ( mine 😀 ) like he was always having the time of his life, enjoying every minute of it, and made watching professional wrestling bearable when nothing else was on TV worth watching. Anyone can impress a fan, but it takes a special kind of person to impress a non-fan. This is sad. He seemed entirely too young to die. He was like a force larger than life. I am glad, though, that his wife is okay. Nice article, TAZZ, and a worthy tribute even for those who did not follow him. It’s sad when anybody passes and although I have no particular affinity for fighters, you’ve made him seem affable enough. Interesting, TAZZ. I’m a bit sad at his passing, but he hadn’t wrestled with any regularity in years. Seems young for this to have happened to him.